Complete your Hudson Reed bathroom with our range of quality contemporary sanitary ware. This Square Close-Coupled Pan & Cistern has been specifically designed to co-ordinate with any of the stunning Hudson Reed furniture packs available. 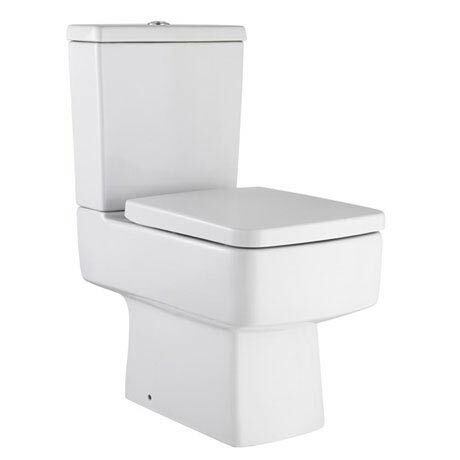 Featuring fully equipped factory-fitted cistern with water saving 4/6 Litre dual flush mechanism. Hi, all modern day cisterns have internal overflow cisterns, so this would overflow into the pan. Thanks, if you have any further questions, please let me know. Q. Does this toilet have a soft closing lid? Hi Lucy, this seat is not a soft close version, we do have lots available however. You can find these under 'Toilet Seats', then 'Soft Close'. I hope this helps! Hi, a top fixing toilet seat is for a toilet which doesn't have access to the underneath and requires fixing from the top. Soft close is the function of the seat and stops this from slamming shut. Hope this helps. Hi. A top fixing seat is required when you don't have access to underneath the pan to secure the fixings. A soft closing seat is a seat where the lid and seat soft or slowly close rather than slam down like standard seats. Hope this helps.